There are three steps to becoming an On My Way Pre-K provider. These steps must be completed in sequential order. Generally speaking, you can expect that it will take several months to become an On My Way Pre-K provider. The length of time to complete the process varies based on accurate and timely submission of documentation. Therefore, you should begin the process as soon as possible to ensure you are approved prior to the beginning of the school year. If you have questions about the specific requirements that apply to your early learning program, please contact the county Project Manager or the assigned Pre-K Consultant for your county and they can help explain it. Below are the specific steps for Schools (public, charter or private) and Community-Based programs, including licensed centers, licensed family homes and unlicensed registered ministries. Select the tab above that applies to your provider type to learn more. If your program meets all of the eligibility standards and you are ready to apply for the On My Way Pre-K pilot, you can go directly to the On My Way Pre-K provider application. Otherwise, follow the steps outlined below. School-based programs have two options for meeting the CCDF eligibility standards. You can become a licensed child care center or a Legally Licensed Exempt Provider (LLEP). If you would like to become a licensed provider, please refer to the licensing requirements on the Office of Early Childhood and Out-of-School Learning (OECOSL) website. You will be assigned to a licensing consultant who can help you navigate through the licensing process. If you do not want your school-based program to become a licensed child care center, you also have the option to become a Legally Licensed Exempt Provider (LLEP). If you wish to become an LLEP you will need to successfully complete the Legally Licensed Exempt Provider (LLEP) Facility Packet. If you have any questions regarding the Legally Licensed Exempt Provider (LLEP) Facility Packet, please contact the assigned LLEP Consultant for your county. After you have obtained your license or CCDF eligibility approval, you will need to register for the Paths to QUALITY™ program. To begin the process, visit the Paths to QUALITY™ page. There are specific Paths to QUALITY™ standards for schools. Your assigned Paths to QUALITY™ coach will answer any questions you may have about the standards. If you are a private or non-public school that is accredited by an approved accrediting body then you are not required to participate in Paths to QUALITY™. However, there are some benefits from doing so, including enhanced reimbursement. To learn more about the benefits of participation, visit the Paths to QUALITY™ website. If your program has obtained licensure, unlicensed registered ministry certification or LLEP certification and has reached a Level 3 or Level 4 in Paths to QUALITY™ you are ready to submit the application to become an On My Way Pre-K provider. If you meet all of the eligibility standards and are ready to apply for On My Way Pre-K, you can go directly to the On My Way Pre-K provider application. If you are a Licensed Child Care Center, a Licensed Class I Child Care Home or a Licensed Class II Child Care Home then you already meet the requirements for CCDF eligibility. If you are an Unlicensed Registered Child Care Ministry, you will need to successfully complete the CCDF eligibility standards before you can participate in the On My Way Pre-K pilot. If you have any questions during this process, please contact your unlicensed registered ministry consultant. After you have obtained your license, you will need to register for the Paths to QUALITY™ program. To begin the process, visit the Paths to QUALITY™ page. There are specific Paths to QUALITY™ standards for Licensed Child Care Centers, Licensed Child Care Homes and Unlicensed Registered Child Care Ministries. If you are an Unlicensed Registered Child Care Ministry, you will also need to complete the Voluntary Certification Program (VCP) prior to enrolling in Paths to QUALITY™. The application for voluntary certification is included as part of the Paths to QUALITY™ standards for Unlicensed Registered Child Care Ministries. You can fill out the VCP application and submit it according to the instructions in the packet. If you have any questions about this process, please contact your unlicensed registered ministry consultant. If your program meets the CCDF eligibility standards and has obtained Level 3 or Level 4 in Paths to QUALITY™ you are ready to submit the application to become an On My Way Pre-K provider. After you have completed the application process and you are approved as an On My Way Pre-K provider, you will need to sign the On My Way Pre-K Provider Agreement. This must be completed prior to enrolling any children into the program. 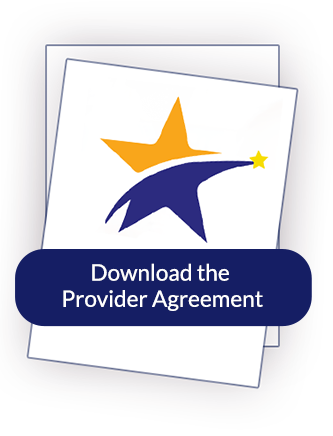 The Provider Agreement outlines the detailed requirements for the On My Way Pre-K pilot. Carefully read each item and place your initials on the line next to each requirement. Providers will need to sign a new agreement each year to keep up to date with any changes to the program. If you have any questions, contact your county Project Manager or the assigned Pre-K Consultant for your county and we can help explain it.